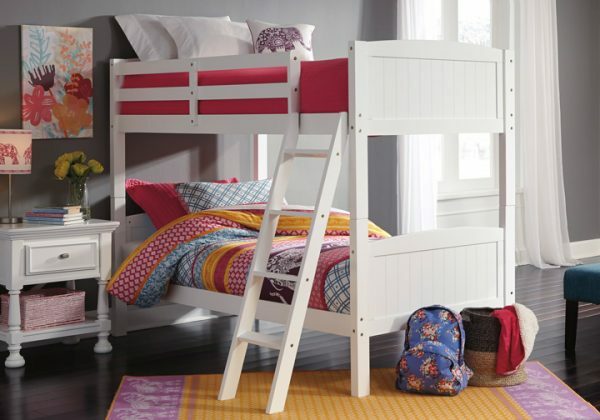 Let your country style shine through with the crisp and cheerful Kaslyn twin bunk bed. The clean lines are classic elements that flow beautifully with cottage-quaint and shabby chic aesthetics. 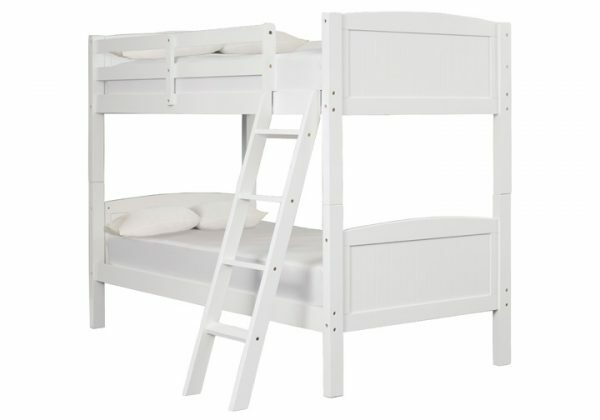 *Mattresses and box springs sold separately. Made with MDF and poplar solids. Clear sealed drawer boxes with ball bearing side guides and dovetail construction. Half round pilasters set on stylish turned bun feet. Cottage styling is earmarked by the use of overlay “X” motifs. Stylish single drawer night stand with open “X” back design. Bright white finish features a durable UV base coat for long lasting beauty. Headboards will accommodate metal bolt-on bed frames ranging from twin to queen as specified in their item description. Beveled mirror. B502-85 studio bed features a spacious bookcase headboard design. Storage base with two side by side drawers with large storage capacity. Drawers are dovetailed with a clear sealed top-coat finish. B502-22 stool is covered with a woven polyester fabric. Features cabriole style legs with two small accessory drawers and oval swivel mirror. B502-22 stool dimension: 17″W x 12″D x 18″H.